News Coverage of the Grizzly Band Receiving Its Grammy Award! 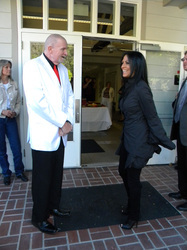 Sierra Sun Times - June 5, 2011 - LISTEN to the Grammy presentation by Sheila E. and the entire concert! 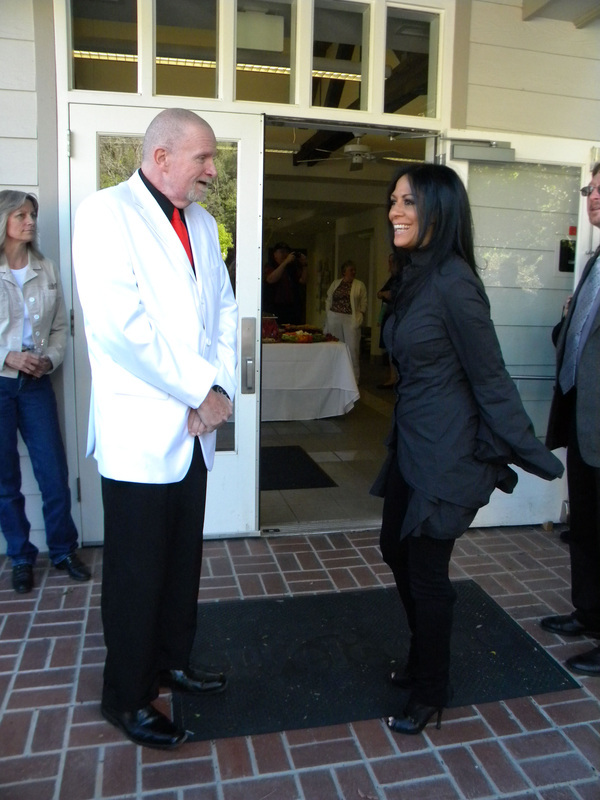 Grammy-Award winning Percussionist Sheila E, famed drummer for Prince, Cyndi Lauper, Ringo Star and many others... as well a top-ten recording artist with her hit single "A Glamorous Life", will appear in Mariposa on Thursday, June 2nd, at MCHS' Fiester Auditorium at 7:00 p.m. She will be in Mariposa not to perform or to receive an award, however... she is appearing to present the Mariposa County High School Grizzly Band with the 2011 Grammy Signature Schools Enterprise Award. The Grizzly Band was chosen earlier this year as one of the top high-school music programs in the nation by the Grammy Foundation, Best Buy, Ford Motor Company Fund, and the Hot Topic Foundation. 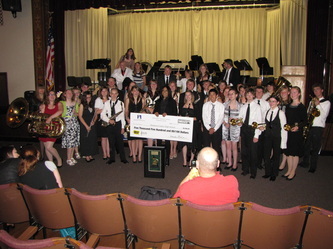 In addition to a Grammy Award, the band will receive a check for $5,500 for the Instrumental Music Program. Accepting the Award for the band will be senior members, Melissa Caputo, Danni Guyton, Stefani Jantz and Justin Le Messurier, with the acceptance speech being given by MCUSD Superintendent, Dr. Aaron Rosander. Following the award ceremony, the popular Grizzly Show Band will perform a set of jazz, blues, R&B, and Rock standards. Just a few of the pieces that will be performed include, "Soul Finger", "Get Ready", and "What'd I Say". There might also be something for our special guest on the program! After intermission, the multiple award-winning Grizzly Concert Band will take the stage, with classical and contemporary wind-band compositions... including original works by the Band's Director, Dr. Phillip Smith. Closing the evening's festivities will be a performance of the band's 2011 Contest Festival Pieces, Alexander Borodin's "In the Steppes of Central Asia" and Mussorgsky's seminal "Pictures at an Exhibition." So, an evening with a beautiful Recording Star, a Grammy Award Presentation, and music for almost every taste... all at the Fiester Auditorium at 7:00 pm. This is Mariposa, after all, not Hollywood... so you will not see the exorbitant ticket prices you would expect of an event of this magnitude. Everyone is invited, and a donation to the band ($5 is the recommended admission), will get you seat at this historic event. You can get tickets in advance from band boosters, members, Cousin Jack's Music, and Sugar Pine Pizza in Oakhurst, or purchase them at the door. But hurry... with the media and special guests, this is sure to be one of the hot tickets of the season in Mariposa! Snacks, drinks and souvenirs will be on sale in the lobby both prior to the concert and during intermission, with all funds going toward the Band's November Trip to New York for the "Band of Pride" 9/11 Tribute and Veterans Day Parade. Mariposa County High School hopes that you will join us as we salute members, current and past, who have made this the "Pride of the Sierra", on Thursday, June 2nd 2011, at MCHS' Fiester Auditorium. The GRAMMY Foundation® today announced that 36 schools nationwide have been selected as GRAMMY® Signature Schools for 2011. Created in 1998, the GRAMMY Signature Schools programs recognizes top U.S high schools that are making an outstanding commitment to music education during an academic school year. 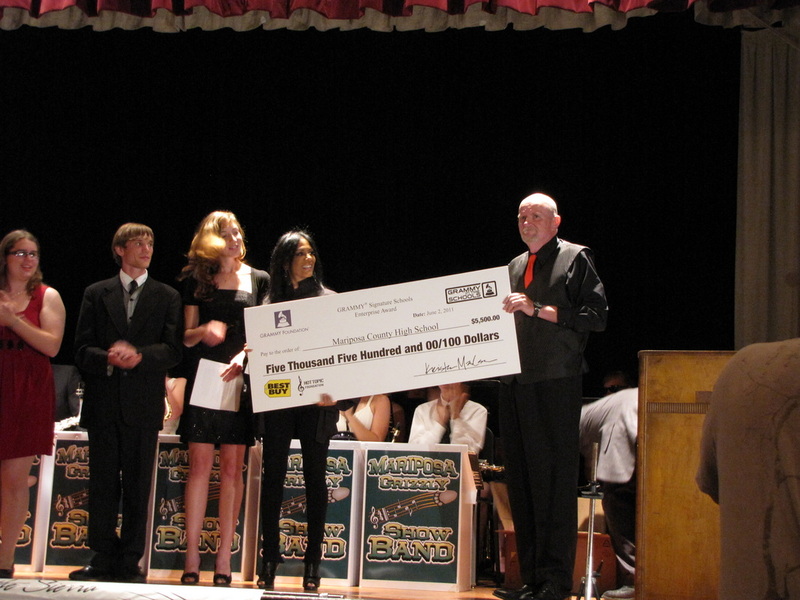 Grammy Signature Schools are made possible in part through the generous support of Best Buy, Campbell’s Labels for Education Program,, the Ford Motor Company Fund, Gibson Foundation, and the Hot Topic Foundation. The Selection process for GRAMMY Signature Schools begins each year in August when over 20,000 high schools from districts large and small, urban, suburban and rural are requested to provide information on their school’s music program. Applications are then scored, additional documentation such as recordings of performances is reviewed by an independent blue ribbon committee of top recording artists and music educators to determine the schools that merit Grammy Signature School Status. 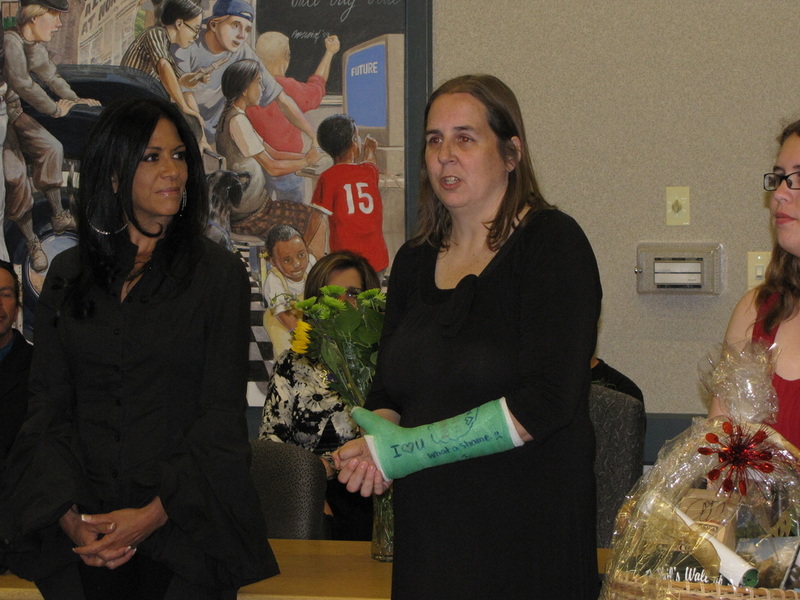 36 schools were selected from the tens of thousands of applications, each will receive a custom award and a monetary grant to benefit its music program and permission to use the title “GRAMMY Award Winner”. 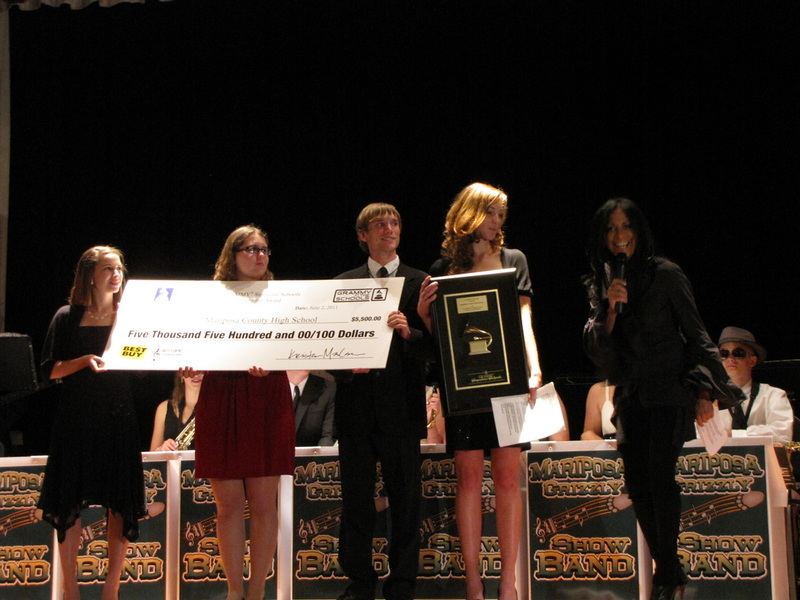 Selected as a 2011 GRAMMY Signature Schools Enterprise Award-Winner was California’s Mariposa County High School. The Enterprise Award is presented to programs that have excelled in economically underserved schools. “The GRAMMY Signature Schools program exemplifies the GRAMMY Foundation’s commitment to fostering excellence in music education in public high schools,” said Neil Portnow, President/CEO of the Recording Academy® and GRAMMY Foundation. “With the generous support of our partners, we’ve been able to grant the largest number of GRAMMY Signature School Awards in recent history, with 36 outstanding music programs in schools across America receiving this special recognition”. The GRAMMY Foundation® was established in 1989 by the Grammy Award Committee, Recording Academy, Recording Artists, and corporate sponsors. It’s goal is to cultivate the understanding, appreciation and advancement of the contribution of recorded music to American culture- from the artistic and technical legends of the past to the still unimagined musical breakthroughs of future generations of music professionals. The Foundation accomplishes this mission through programs and activities that engage the music industry and cultural community as well as the general public. The Foundation works in partnership year-round with it’s founder, the Recording Academy®, to bring national attention to important issues such as the value and impact of music and arts education and the urgency of preserving our rich cultural heritage. (Local) Winning the Award for Mariposa County High School, was the Grizzly Concert Band, under the direction of Dr. Phillip Smith. High School Orchestras, Symphonic and Concert Bands, Jazz Bands, Choirs, Choruses and other performing arts groups from across the nation submit recordings of performances for the selection process. Five tracks are judged, with most schools submitting a track from each ensemble in the program (Choir, Orchestra, Symphonic Band, Jazz Band, etc.) Mariposa County High School was fairly unique, submitting one ensemble (the concert band) for critique. The recording entered was from the band’s May, 2010 performance at Forum Music Festival’s Judges Invitational in Anaheim, California. They performed Fucik’s “Entry of the Gladiators”, Dr. Smith’s “The 49ers”, “Mountain Mornings” and “Mariposa” from his “Gold Country Suite”; and Gustav Holst’s “Mars, Bringer of War”. Their performance recording was deemed as one of the best nation-wide by any high school performing arts program.